A screen capture from our recording session featuring Ms. Kat Murphy! It’s our very first episode! I know y’all have been super excited about it! We are! 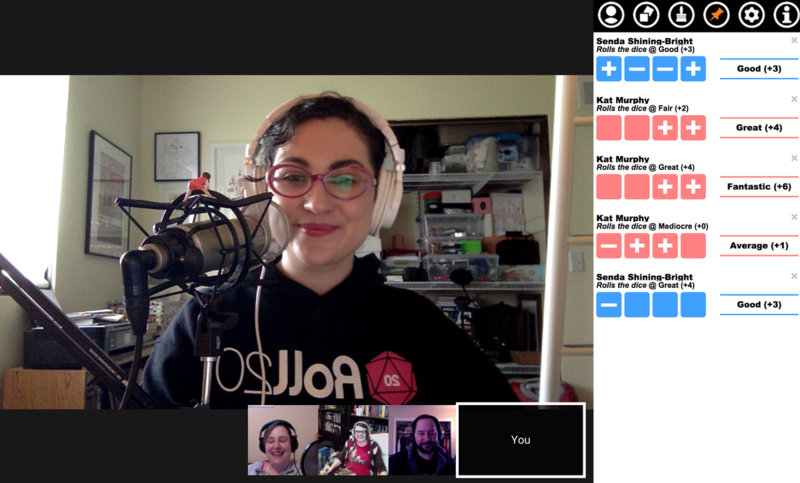 Joining our co-hosts Senda and Emily are one of the best GMs in the pod-o-sphere Kat Murphy of One Shot & Campaign Podcasts and the pocket dungeon pioneer himself Travis Parker from Golden Griffon Games. We dive into Fate Accelerated Edition (FAE) with the prompt “sci fi smugglers” and just let the brains of everyone involved take it from there. FAE is made for pick-up games. It’s a slimmed down version of Fate Core focusing on how a character would approach a problem rather than defining what kinds of skills a character would use. It’s definitely a story-first RPG. Check out SASGeekPodcast on Twitter & Tumblr. This is super awesome to start out. I love all the Star Wars goofs, especially since I’m just going to be going to see The Force Awakens in a few days. Totally love how absurd the setting has ended up being, and just a wonderful job and wonderful luck in when the players failed rolls and how well that worked.